– This week was “Video Game Movie” week on Held Over. I looked at vintage movie ads for War Games, The Wizard, Street Fighter and Mortal Kombat. – On Tuesday I discussed all the new movie releases on DVD/Blu-Ray for the week including the Auburn National Champs DVD as well as Alien vs Ninja, Weeds Season 5 and the 523rd season of Survivor. 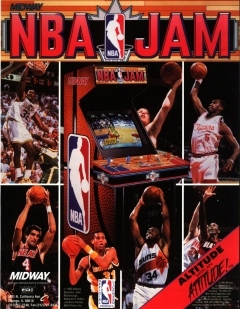 – In this week’s Forgotten Favorites I remember one of the last great arcade game franchises, NBA Jam. This entry was posted on February 25, 2011 at 10:23 am and is filed under blogging with tags blogging. You can follow any responses to this entry through the RSS 2.0 feed. You can skip to the end and leave a response. Pinging is currently not allowed.